Many have warned that if women's unpaid work were to be duly counted, the economic model as we know it would fall apart. Yet, are we aware of how the world would be fed if women in the rural areas simply stopped? According to UN reports, the share of women in the agricultural labor force [PDF] comprises just over 40 percent in the "developing world", ranging from about 20 percent in the Americas to almost 50 percent in Africa. These figures may be enough to grab our attention, but fall far short of the real numbers when all the work undertaken by women throughout the production, processing and distribution of food is taken into account. The reality then is, numbers are much higher. 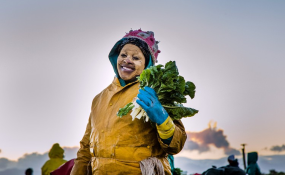 To have an image of the production value of women in the food system – agribusiness dominated - one has to consider the producers who depend on farming, fisheries, livestock rearing, gardening and gathering of forest food. One must think of the women working on the tea plantations in India and in the cotton fields of Burkina Faso, or of the afro-descendant peasant women in the Cauca region of Colombia. Yet beyond these recognized as "agricultural activities", other important jobs are carried out by women, crucial to the production process. Take a moment to think about the mother, sister and daughter sewing fishnets, preparing family food for the day, fetching water and firewood, and cultivating small plots of vegetables for household use. These are simply not accounted for, even if they have a significant impact on our lives and the global economy. If women are so essential, the world should wonder why women in the rural world tend to end up at the bottom of the food chain. A civil society report about Nepali women points to a recent phenomenon called "the feminization of agriculture": the poorer the area, the higher women's contribution as subsistence farmers or as low paid casual agricultural workers. Women jobs in the rural areas are usually seasonal, part-time and low-wage. In addition, their household chores, necessary for social reproductive labor, are unpaid by employers, undermined by society and unrecognized by legislation. The reality lived by women is not news for governments, international financial or development institutions, nor corporations. Unfortunately, problem-solving or awareness raising to tackle the issue has often failed. Women's plight is normally neglected or ignored, and in the instances where solutions to the multiple forms of exploitation they are subjected to are offered, they are dubious at best. Disguised under the premises of corporate social responsibility or via misinterpretation of women's human rights postulates, both the participation of affected women and their capacity to overcome these threats have been reduced to - top-down - "empowerment" or so-called "gender mainstreaming" projects. These corporate-driven solutions have frequently incentivized mischievous "multi-stakeholder" dialogues that prioritize profit over the concerns and needs of women. Likewise, they have tended to favor the application of a certain restrictive gender perspective in order to introduce women into exploitative labor markets and expose them to microcredit programs that legitimize, what feminists, such as Nancy Fraser, have called "marketization and state retrenchment". Conquests towards emancipation have also found a way to be reflected in the today's human rights norms. Urged by organized women worldwide, advances in this respect relate to the recognition of women in the rural areas as specific right-holders of equal pay, access to productive resources, land, seeds, and water, and other public services, frequently out of reach. What's more, the universal human rights system has begun to conceptualize about state-based violence towards rural women, and the disproportionate violation of their rights when confronting the business sector. Andrea Nuila Herrmannsdorfer is Women's Rights Coordinator at FIAN International, a human rights organization working for the right to food and related rights worldwide. Copyright © 2018 FIAN International. All rights reserved. Distributed by AllAfrica Global Media (allAfrica.com). To contact the copyright holder directly for corrections — or for permission to republish or make other authorized use of this material, click here.